What do I need to take along when leaving my dog ? WHAT DO I NEED TO TAKE ALONG WHEN LEAVING MY DOG WITH A PETSITTER? When staying in a host family, it is a real holiday for your pet! 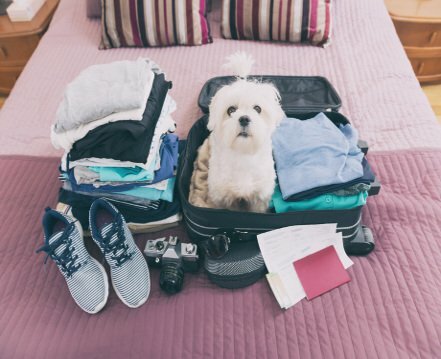 What do you need to take along when leaving your dog with a petsitter? Food, medical records, bed and treats, it's important to make your pet feel at home in his new surroundings. What do I need to take along for a smooth stay? The separation can be a very hard moment for your pet and rather traumatizing. To help him feel at ease and comfortable in his holiday home, you’ll need to take along several items to reassure your pet and not to upset his everyday habits. Let’s begin with his diet. It is obviously highly recommended to take along enough of his usual food. Even if the dog sitter will more than likely give him treats, he’ll be more than happy to find his favorite biscuits or meat in his food bowl! Taking along his brush or comb could be useful too. Long haired dogs, after an afternoon walk, often need a good groom to get any mud or leaves out of their coat and it is always better for your pet to have his own comb nearby. This grooming moment is also a privileged time between the host and your dog and may become a bonding moment. Your dog’s comfort must be primordial for you and your dog sitter. If your pet is used to sleeping on a cushion or in a basket, or has a favorite squeaky toy, please do take them along. During the whole stay it is important to maintain his same habits. If you’re away on holiday while your dog is at the pet sitter’s[lien vers N-1], his new host family will fully take care of your pet. They will take him out on walks, feed him, maybe even meet up with other animals; all these situations may be risk factors. It is therefore essential to take your pet’s medical records along with you, if for any reason the host must take your pet to the vets, by taking his details the vet will have your pet’s medical background. What should I plan for when I take my pet home? Once the care is over, time to go home and get back into a daily routine … a few issues should be sorted out first. Make sure you take home all your pet’s belongings, without forgetting his bed or favorite toy. It is always easier for your pet to go home than to leave so no need to worry, if all went well, your dog should be happy to see you! However, don’t forget your pet has spent several days away from home. New friends have been made, new habits have settled in, new toys have been found… before actually taking your four-legged friend home, try to spend a short moment with the dog sitter to see how things go. What new tricks your dog might have leant, what games they have played. It is always interesting to discuss these things over and even to exchange tips!